Versatile enclosures for housing prototypes, adapters, testers, etc. Moderate-dissipation components may be directly mounted to the case for heat sinking. Connectors, switches, controls and indicators are easily installed on the front and rear covers. Sides: Grooved; attractive and rugged extruded aluminum sides (.08" thick) can withstand severe abuse. Top and Bottom Covers: Perforated aluminum (0.032" thick); ideal for ventilation. Front and Rear Covers: Aluminum (0.032" thick). Color: Flat gold. Sides are flat black. 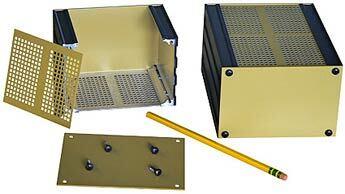 Mounting: Threaded mounting holes are provided to permit mounting the boxes to an equipment frame or bracket. Accessory Mounting Kits are available for wall mounting or DIN Rail mounting. Heat sink: A heat sink can be ordered for the left side to replace the grooved aluminum side. High-dissipation semiconductors may be mounted on the accessory heat sink. To order, add suffix "H" to model number and $2.00 to price (for models EG9H and EG13H, add $4.00). Mounting Kits: For wall mounting or DIN Rail mounting.